By the time I had finished my proposal for Cashel Arts Fest, had a chat and some lunch with Carmen, Mariate and Alan it was four o’clock and we (with the exception of Alan!) were all ready to get down to a bit of felting (or sewing in the case of Mariate) for the rest of the afternoon. Carmen laid out a gorgeous scarf and I started to decide exactly how I was going to make a ring using merino and a well worn piece of driftwood collected on a recent trip to the beach. It took ages deciding which piece of driftwood to use as when you are a confirmed hoarder like me it is difficult to use anything from your stash in case you mess it up and end up wasting the piece! I had a couple of minutes trying to work out how to attach the bit to Alan’s small drill but eventually decided just to run with my own Makita and not worry about the concequences in the event of any misadventure! Choosing the colours for the felt was easy, the dark patina of the wood lent itself to orange, yellow, wine and green Autumnal colours, no surprises there. Overall I was very happy with the end result and plan on wearing the ring tomorrow when I go to a podcasting course organised by ArtL!nks. 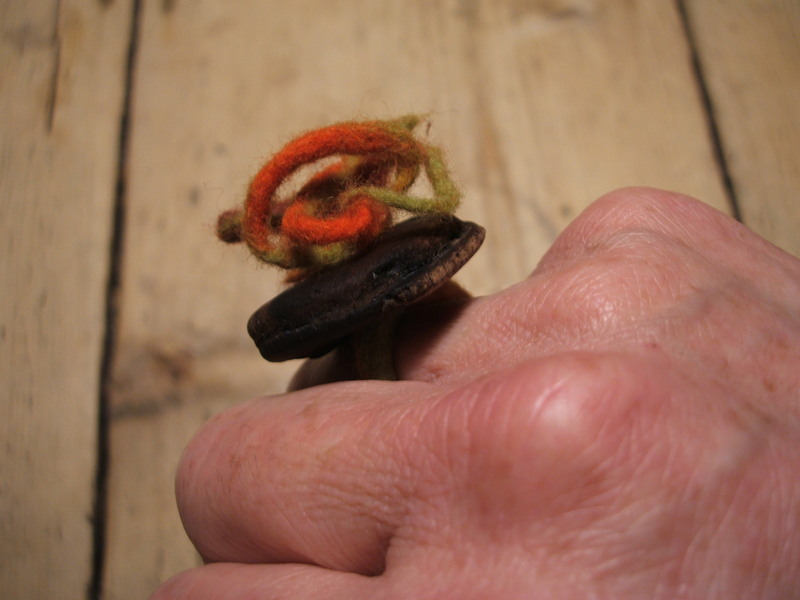 I also felted another ring using bone and merino and then made an experimental cuff using merino and some very sequined jersey fabric that Carmen got as waste from an Irish dress designer. Unfortunately it will be Tuesday or Wednesday before I get to felt again but now that I have got started combining felt and found objects I will be planning some more pieces of jewellery and then hopefully some bigger three dimensional projects which are floating around in my head at the moment. Busy day today and combining felt with found objects, my fun project for tomorrow! Well, I am just going to see how long it takes to write and upload this post, started at 19.39 and counting………. Today was Carmen’s birthday and we had an active day variously felting, weaving, chatting and catching up with our friend Martina who called in on a special visit from the other side of Ireland especially in honour of the birthday girl! Tomorrow we are going to be joined by more friends Cristina and Mariate for a felting, chatting and eating marathon. You may wonder how Alan fits into the middle of this activity (especially since he really doesn’t like all that fluffy wool stuff!!) but this weekend was put in motion when he announced his trip to visit his parents and since he did not travel due to a cold what else can a girl do except persevere with her plans? My objective tomorrow is to make some small three dimensional pieces and then combine them with found objects from my stash to create unique and funky felt and recycled jewellery. I got a GREAT book during the week through Amazon, ‘Fabulous Jewellery from Found Objects’ by Marthe Le Van. For the first time ever I now have some technical knowledge which shows me the safest way to drill through stones, work with precious and semi precious metal and basically gives clear step by step instructions for some of the necessary jewellery skills required when working with various types of new and found objects. Alan has lent me a very small drill ( mine is a BIG Makita power tool!) and I have loads of ideas floating around in my head so hopefully I will have a few photos tomorrow to show you how everything is progressing. The other necessary thing I have to do in the morning is put together a proposal for the Cashel Arts Fest. This event does not take place until November but the organisers are sorting out the workshops sometime this week and I really would like to have something fun and interesting to offer for the children. I am not going to bore you with details of all my technical problems at the moment but suffice to say I am off to try and buy a new laptop immediately I upload this post otherwise I am going to need serious counselling for computer rage and anger managment! Yesterday I managed to finish my arts grant submission thanks in no small part to the fabulous printer (cheers for the simplicity of Epson ) I invested in on Wednesday afternoon. You may well ask yourself how I am going to fund all these new technical products but the way I feel today if I have to spend another 50 minutes starting a computer, half an hour trying to access gmail, over an hour writing and uploading a blog post and if 20 images of my felt cost E98 in hard copies (I nearly passed out!!!) new equipment will save me both time and money so I have to find the money somehow. I know that Carlow Co. Council may not have many funds to grant the arts this year but fingers crossed they will send a little my way and hopefully this will help fund my intended trip to the international felt symposium ‘Felt, Naturally’ in Silkeborg, Denmark from 28th July to 1st August 2010. This symposium sounds fabulous and I really would like to attend to further my studies in various aspects of sculptural felting. The Danish felting group Grima are organising the event to celebrate their twentieth anniversary and if you are interested in finding out more click the word Engelsk Brochure when you link through to their excellent website. As promised here is a photo from my felting students at last Sunday’s ‘Pick up your Needles’ workshop in the Courthouse Arts Centre, Tinahely. 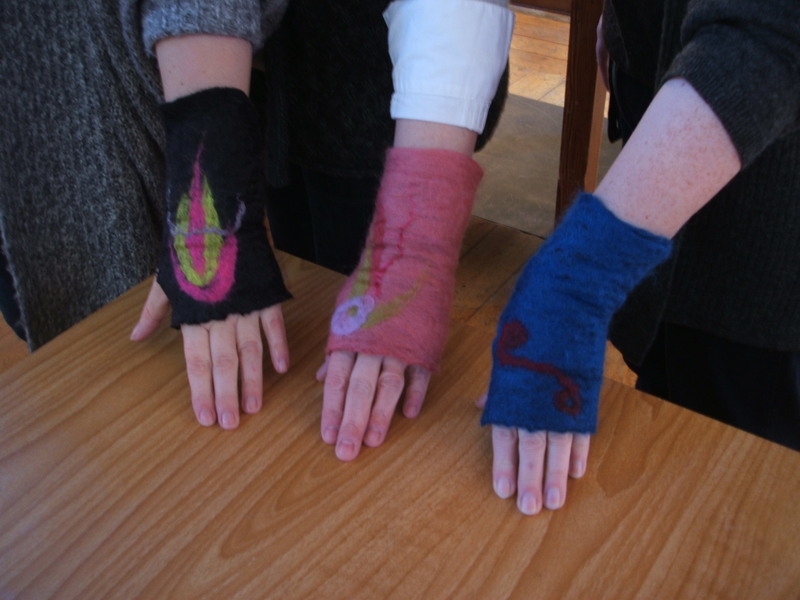 Our first project in the morning was a piece of flat felt so that participants could see how the felting process actually occurs (most participants had never felted before) and then in the afternoon everyone made themselves a gorgeous pair of warm and comfortable fingerless mittens. Unfortunately I really was not feeling 100% on Sunday (cold was in full flow) and think that I needed to make the resists for the mittens a little bit wider. We only discovered this when everyone got to the stage of putting the mittens on for the final felting and working to size. Some of the mittens were extremely tight but luckily heating them up in the microwave helped stretch them a little and everyone was very understanding and delighted with their work so all in all a good day was had by everyone! I seem to have picked up a bad cold over the last few days and it didn’t help that I had three individual meetings at the golf club today which were totally necessary to attend. Following on from another excellent ‘Pick up your Needles’ at the Courthouse Art Centre in Tinahely yesterday (more details and photos to follow from my felting participants over the next day or two as soon as my cold abates) I decided to stay in my p-js this morning and not get dressed until just before my first meeting at 2pm this afternoon! To wrap myself snugly I wore the yak and silk scarf that I felted with hand dyed fibres purchased from Urban Fauna Studio in San Fransisco and at the risk of boring everyone this fibre is an absolute dream to work with, beautifully soft, warm and flexible to wear. If any of you have access to Blas and Jamie’s wonderful studio/shop do look out for this stunning yak fibre. I know that it had only just arrived in stock for the first time when I visited last September but I guess that Blas should have it regularly now considering there must be a big demand for such a beautiful fibre. 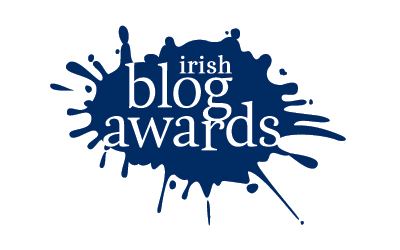 Tomorrow I am going prepare my submission for an ‘Arts Act Grant’ from Carlow County Council. Last year they awarded me E200 for professional development and this was extremely welcome funding which went towards my expenses for the international symposium Felt in Focus. 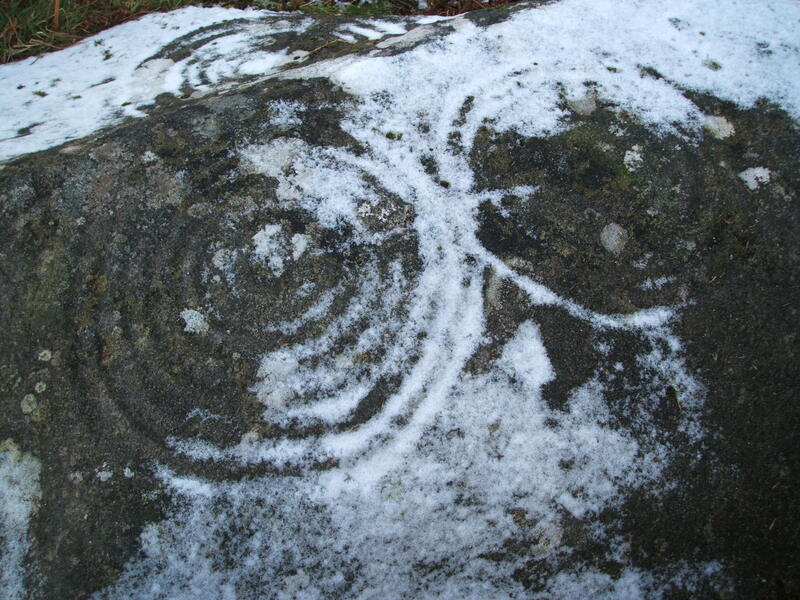 Finances are very tight here in Ireland and it is brilliant that the local authorities are still prepared to fund certain individual and group artistic indeavours to benefit our local community.